A sign in a market window advertises the acceptance of food stamps in New York City. A heated battle is brewing on Capitol Hill over cuts to the food stamp program, with lawmakers quoting Bible verses at each other and benefits for millions of people hanging in the balance. Nearly 47 million people – one in seven Americans – rely on food stamps for some or all of their daily sustenance, according to the Department of Agriculture, a number that has grown nearly 70 percent since the financial collapse of 2008. The increased enrollment has caused costs to soar from $35 billion in 2007 to $80 billion last year, and now lawmakers in both the House and the Senate are targeting program for cuts even as advocates cry foul. Legislation making its way through Congress would eliminate billions of dollars in funding for the Supplemental Nutrition Assistance Program, better known as food stamps. Last week, a Senate committee approved striking $4.1 billion from the program over 10 years and a House committee backed cuts five times as large. Those actions set the stage for a congressional showdown not only over how much to slash the program, but also over the role of government in fighting hunger and poverty. During contentious debate over the Farm Bill, which funds food stamps, in the House Agriculture Committee, Rep. Juan Vargas, D-Calif., invoked the Book of Matthew as he noted his opposition to the cuts. “[Jesus] says how you treat the least among us, the least of our brothers, that’s how you treat him,” Vargas, adding that Jesus specifically mentions the importance of feeding the hungry. Republican Congressman Stephen Fincher of Tennessee, who supports cuts to the program, had his own Bible verse from the Book of Thessalonians to quote back to Vargas: “The one who is unwilling to work shall not eat,” he said. The left-leaning Center on Budget and Policy Priorities estimates that the House version of the farm bill making would throw nearly 2 million people off food stamps, most of whom are working families with children or senior citizens. More than 200,000 kids would lose access to free school lunches, according to the group. The more modest Senate proposal would cost half a million SNAP recipients $90 each month, according to the nonpartisan Congressional Budget Office. For a family of four, the current maximum monthly allotment is $668; recipients get less as their income rises. The cuts come on top of the looming expiration of a temporary funding boost the program received in 2009 as part of the American Recovery and Reinvestment Act that will also slash recipient benefits. “It is impossible to impose these types of cuts to SNAP without having the most vulnerable in our society suffer,” said Stacy Dean, vice president for food assistance policy for the center. Most households that get food stamps include either a child, a person over 60 or someone who is disabled, according to federal data. And all are either poor or low-income: To be eligible for food assistance, income must not exceed 130 percent of the federal poverty line -- roughly $30,000 annually for a family of four. 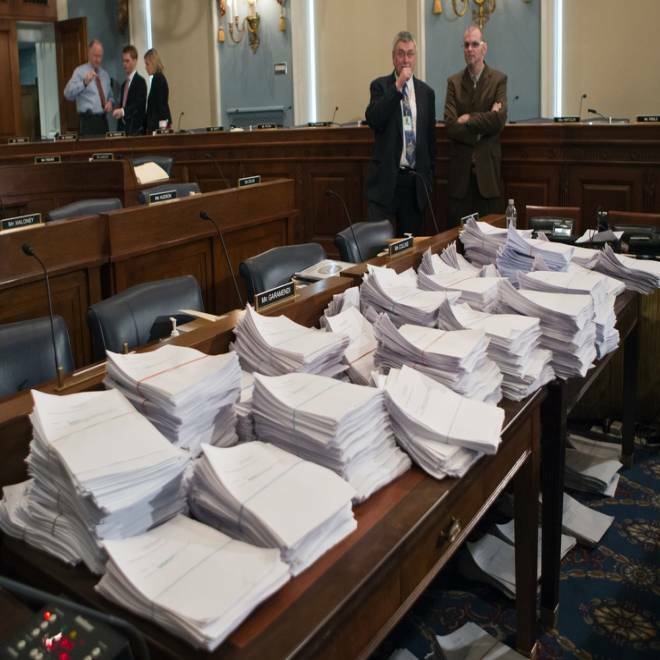 Stacks of paperwork await members of the House Agriculture Committee as they consider the 2013 Farm Bill, which includes cuts to the $80 billion-a-year food stamp program. As the economy slowly improves, dependence on food stamps has yet to decline. Decreased enrollment in the program typically lags substantially behind economic recovery, and congressional forecasters predict that under current law more people will seek benefits from the program before the rolls go down. Advocates for food stamps argue that many of the jobs created during the recovery have been low-wage, and as result the working poor often qualify for food stamps even though they are employed. 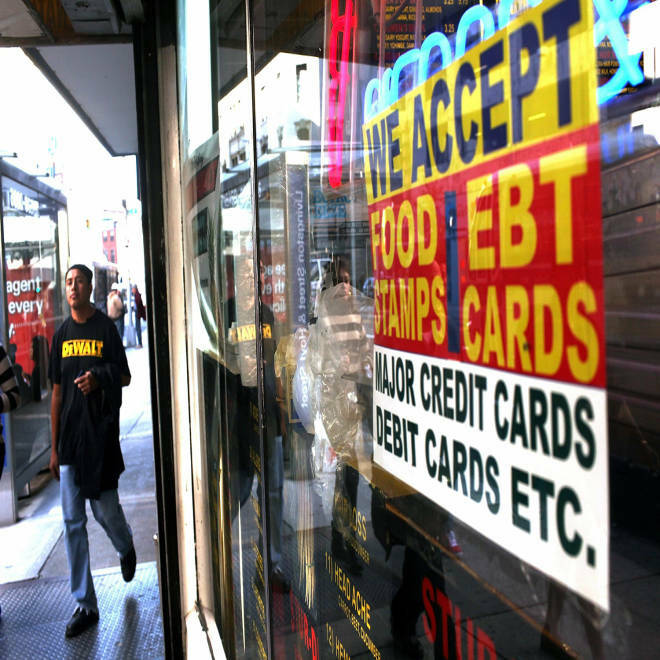 Rachel Sheffield, a policy analyst for the conservative Heritage Foundation, said the proposed cuts to the food stamp program are minimal and are part of a much larger issue over how much the government spends on welfare as the country continues to go into debt. "The approach of the federal government really has been throwing money at the symptoms of poverty rather than addressing the causes of it," said Sheffield. The think tank calls for adjusting spending on SNAP to pre-recession levels, taking into account inflation, and also strengthening the work requirements for able-bodied adults. Some Republicans believe the expansion of food stamps under President Barack Obama has been an intentional political strategy to win the support of low-income voters, an issue that took prominence during his 2012 re-election campaign. “It seems to me that the goal of this administration is to expand the rolls of people who are on SNAP benefits, the purpose of which is to expand the dependency class," said Republican Congressman Steve King of Iowa. Advocates for the program say it has helped stave off hunger and deprivation for many families at a time when jobs have been hard to come by. James Weill, president of the Food Research and Action Center, is working with food banks and organizations that focus on hunger issues to lobby Congress against slashing food stamp spending. For them, it is not a matter of politics or theories on the role of government, but a matter of getting people the assistance they need.